All you need to know about your reservation with AB Apartment Barcelona. Our Terms & Conditions cover everything from booking amendments to guest reviews. The company has been established to provide an outstanding selection of fully furnished short and long-term stay apartments and related services to an international client base, as well as offering tourist information and services. AB Apartment Barcelona has negotiated the best possible rates for its clients and there are no hidden extras/costs or booking fees involved. These are AB Apartment Barcelona’s general Terms & Conditions, which cover payment, booking and other information regarding the company’s services. Reservations are made by paying a prepayment on the total amount of the stay. This prepayment can be made online via credit/debit card, transfer or PayPal. The reservation will only be completed once AB Apartment Barcelona has received your prepayment and you have received your confirmation email. In case of cancellation, no refund will be made on the prepayment. For some reservations you may also be offered the option to pay the total amount of your stay up-front (except the refundable damage deposit and the tourist tax) if you wish. If this option is available it will be shown on the payment page. For more information on reserving an apartment, please see our How to Book page. Persons under the age of 18 are not permitted to reserve an apartment without the consent of a parent or guardian. If we receive information that a minor under 18 years of age has made a reservation with us in these circumstances, we reserve the right to cancel it. Please note: if you have a promotional code, it must be applied during the booking process. It is not possible to apply the discount once the booking has been made. We guarantee to offer you the lowest price on GI referenced apartments only. If you find your reservation on another website at a lower rate after already making your booking with AB, contact our Customer Service Team immediately. We will reimburse you the difference between our price and the competitor's price provided that the other deal is bookable online and is still available when we check, and that the reservation is exactly the same as the one you made on our website (same apartment, same dates, same number of people etc.). As stated above, once the prepayment is received, AB Apartment Barcelona will send you a confirmation of the reservation via email, which will indicate the amount to be paid upon arrival. The confirmation email will also contain the name, address, telephone number and the email address of the apartment owner/representative (if applicable), as well as instructions on where you should go to check-in. If you do not receive this confirmation email within 24 hours of making your reservation, please notify AB Apartment Barcelona. You will be required to provide the owner/representative with information on your flight times (where applicable) and your estimated arrival time within 3 days of your arrival. If you are arriving after 20:00h, you must contact the owner/representative on the day of arrival to confirm your arrival time at the apartment. As mentioned above, details of where you will be required to go for check-in will be provided in the confirmation email, as well as the full contact details of the owner/representative. There is no refund in case of delay or early departure. The keys to the accommodation will be handed over by the owner/representative once the remaining balance has been paid, including the damage deposit and any other additional costs. All costs will appear previously in the reservation confirmation. Check-in time is from 15:00h and check-out time is at 11:00h. Please note: Arrivals after 20:00h will be subject to an extra fee of 30€ and arrivals after midnight (00:00h) will be charged an additional 45€, unless another amount is stipulated on the apartment page. There is no late check-in fee for apartments with GI reference numbers.. If you require a late check-out and we have agreed to accommodate you, you will be required to pay the full cost of one night's rental. Please note: Any unauthorised late check-outs will be penalised. Details of the amount to be paid upon arrival will be stipulated in the confirmation email. We do not accept cheques. As stated above, in order to obtain the keys to the accommodation, you must pay the amount of damage deposit indicated in the confirmation email. This deposit will be returned by the owner/representative after assuring that the accommodation is in the same condition as when the client entered. For all rentals of 32 days/31 nights and under, the damage deposit will be returned between 4 and 7 days after departure. For all rentals of more than 31 days/30 nights, the damage deposit will be returned by bank transfer or PayPal up to 30 days after leaving the apartment, once the apartment has been inspected and any outstanding Internet and utility charges (gas, water, and electricity) and/or charges for damage to the apartment have been deducted. Please note that AB Apartment Barcelona does not accept any charges for deposit refunds made by bank transfer or PayPal, whether for long or short-term stays. Please note that for stays of 32 days/31 nights and under all charges for utilities are included in the rental fee, provided that the fee does not exceed the limits of normal and proper use. If a misuse of the utilities is detected leading to a charge which is above average, the client must pay the utility bill. Utility charges for monthly rentals are not included in the total cost of the rental. If you are staying in the apartment for more than 31 nights, then you will be required to pay the bills for electricity, water, gas and Internet on a monthly basis. AB Apartment Barcelona does not accept any PayPal charges nor any other transfer charges for monthly payments or deposit refunds. In case of cancellation, no refund will be made on the agency fee or the first month’s rental amount. Cancellations must be made in writing. Linens and towels are included in the rental price for stays from 31 nights to 11 months. For more information, see our monthly rental conditions. If you wish to extend your stay in the apartment once the rental period is over, you will be required to pay the agency commission again. The number of guests occupying the apartment must coincide with the number of guests on the reservation confirmation. No changes should be made to the number of guests without previously notifying the owner/representative. Once a reservation has been confirmed, any increase in the number of guests in your reservation could result in a price increase. If you wish to decrease the number of guests in your reservation, the total price will remain the same. Animals will not be accepted in the apartment unless stipulated otherwise on the apartment’s description page on our website. Our apartments are located in residential areas and buildings, therefore parties are strictly prohibited in all apartments. We kindly ask guests to respect the neighbours and refrain from playing loud music or creating loud noise in general after 22:00h. Should a guest fail to comply with this condition, resulting in a complaint from the neighbours and/or the police being notified, AB Apartment Barcelona reserves the right to immediately remove all guests from the apartment and retain the damage deposit. As stipulated in the contract which you must sign upon checking-in to the apartment, you are responsible for the behaviour of yourself and for the behaviour of the rest of the party residing in the apartment. Should any of the guests behave in an unsuitable, criminal, offensive or violent manner, AB Apartment Barcelona reserves the right to immediately remove all guests from the apartment and retain the damage deposit. If you and your accompanying guests are removed from the apartment by AB Apartment Barcelona or the owner of the apartment, you will have no right to any claims of compensation and you will consequently lose all payments made on the apartment rental, including the damage deposit. A. In case of force majeure or unforeseen circumstances (including, but not limited to: unscheduled building works, water leaks, etc.) resulting in AB Apartment Barcelona being unable to provide you with the apartment that you booked, you will be notified and offered an alternative apartment of similar characteristics. In the case that you should not agree with the new apartment proposed, you have the right to cancel the booking and receive a total refund. AB Apartment Barcelona will not be liable for further claims made by the client in this situation. B. If you wish to increase the number of nights or guests in the apartment, subject to availability, you will be charged the same rate per person per night as stipulated in the original booking. However, please note that should you wish to decrease the number of guests or nights you will be staying in the apartment there will be no change to the total rental price once the reservation has been confirmed. Guests are responsible for the condition of the accommodation during their stay and are responsible for any type of breakage, deterioration or loss that occurs in the apartment, including damage to or loss of furniture, appliances, keys, etc. In the case that an item is damaged or lost, the owner/representative may demand payment for the item which will be deducted from the damage deposit. If the damage deposit does not cover the cost of reparations to or replacement of the item, then you will be required to pay the difference. You must immediately inform the owner/representative of any damage, breakage or loss that takes place during your stay. NOTE: AB Apartment Barcelona (COME2BCN, S.L.) will not be responsible for direct or indirect damages that may cause the use of the inadequate infrastructure, including but not limited to: destruction, loss after fire, theft, crime, accidents or other damages. Guests must return the apartment to the same state of cleanliness as found upon arrival, except for dirtiness caused by normal and acceptable use of the accommodation. AB Apartment Barcelona can provide additional cleaning services at an extra cost, should you require them. The tenant agrees to receive, every four days and while the stay is extended, a cleaning service in the apartment (non-waivable) by personnel sent and paid for by COME2BCN, S.L (AB Apartment Barcelona). This service will be included in the total rental price. The property owners provide us with all property descriptions. We make every effort to keep the information as accurate as possible through continued contact with the owner and periodical visits to the apartments. We do not take responsibility for discrepancies that may occur in the descriptions, but will act on behalf of our clients to inform the owner of the apartment and resolve any issues that may arise as a result. If you should find a problem in the apartment upon entry or during your stay, including issues with cleanliness and broken or missing items, it is your responsibility to contact the owner/representative immediately, who will endeavour to resolve the issue as soon as possible. The issue should be resolved within a reasonable period of time, however, if a solution cannot be provided, you may be moved to an alternative apartment of similar characteristics, subject to availability. Compensation will not be awarded outside the period of stay if the owner/representative has not been notified of the issue during the stay. The feedback we receive from our customers is very important to us. Therefore, we may send you an email promptly after your stay, inviting you to complete our client review/online survey form. By completing our client review/online survey, you accept that we may publish the information you provide on our website for the sole purpose of informing future customers of your opinion of the quality of the apartment and of the quality of service you received from AB Apartment Barcelona. We reserve the right to use, reproduce, modify, adapt, translate, distribute, publish, create derivative works from, publicly display, refuse or remove reviews at our discretion. The information you provide may be also be shared with our affiliated, co-branded and/or linked website partners. 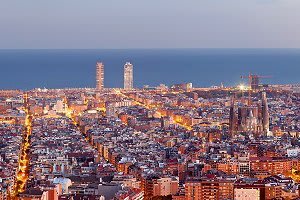 Barcelona’s tourist tax is €2,48 per person and night, for a maximum of 7 nights. It is not included in the price. Anyone under the age of 17 is exempt. How to pay: The tax must be paid to the owner/representative of the property upon arrival. The tax will then be transferred to the Generalitat de Catalunya. The aim: to maintain a commercial relationship and send communications about our products and services. Data conservation criteria: data will be kept while there is a mutual interest to obtain the final aim. When it is no longer necessary for this purpose, it will be deleted with the adequate security measures to guarantee the pseudonymisation of the data or the total deletion of the same data. - The right to file a claim with the Control Authority (agpd.es) if it considers that the data management does not comply with current regulations. Mailing address: COME2BCN, S.L .. GRAN VIA DE LES CORTS CATALANES, 558 Baixos 08011 BARCELONA (BARCELONA).